What Makes a Good Digital Humanities Project? The purpose of the project should be clear, without users needing to dig deeper to find out why the site or project exists. Without a clear objective in mind, projects risk becoming too expansive, scattered, and/or diluted in their content and/or message, thereby limiting their relevance and usability. Book Traces has a very clear purpose, stated directly on the home page. Due to this, it’s quite easy to see how the information on the site is unified. A good Digital Humanities project needs to be easy for users to navigate and use. An over-complicated design or interface makes the project less useful in the long run, since users need to be able to find what they’re looking for as quickly and easily as possible in order for the project to have any merit for scholarly/research purposes. A good Digital Humanities project should be as aesthetically pleasing as possible, without the design distracting or deviating from the purpose of the project. This keeps the project interesting and engaging, and, if done right, can help further immerse users in the information contained within. Locating London is beautifully designed, with consistent color themes and imagery that, together, enhance the experience of scrolling through the black and white maps of London the site contains. Digital Humanities projects should aim to be as scholarly as possible, providing relevant, consistent, accurate information that can be effectively used for research purposes. The Charles Booth Online Archive is quite scholarly, allowing users to see the demographics of specific locations in Victorian London, as studied by Charles Booth, as well as search the specific records used to generate this data. How do Digital Humanities Projects Allow Scholars to Ask New Questions? Digital Humanities allows scholars to ask new questions by making connections between topics and types of data that were never before so easily comparable. For example, a GIS mapping project can provide comparative, multi-era overlays of the same area, showing differences over time in some specific category, and it is able to do this all in the same space, in an interactive way. Digital Humanities makes the easy effortless, the possible easy, the difficult possible, and, in some cases, the impossible a reality. In A Scandal in Bohemia, many fictional locations are mentioned (mostly related to Irene Adler, oddly enough). 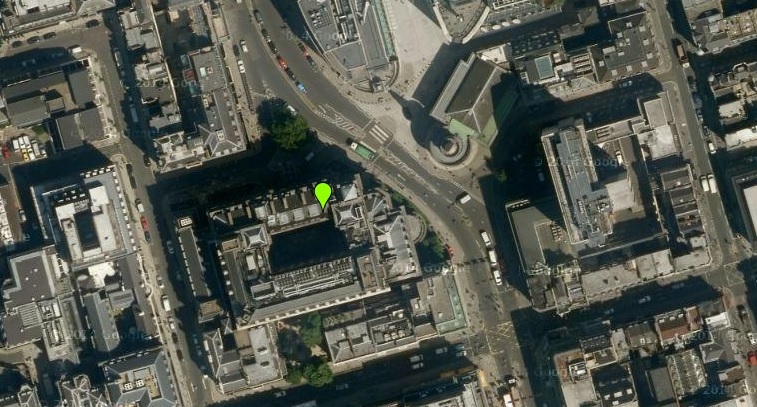 However, there were a few actual locations in the story, one of which being the Langham Hotel, where the King tells Sherlock Holmes he’ll be staying at. The Langham, situated at the corner of Langham Place and Portland Place, appears (at least in the modern view) to be an exquisitely grandiose establishment, which would make sense considering the fact that Arthur Conan Doyle chose to include it briefly in a way that would imply it is truly fit for a king. In order to learn more about the demographics associated with this hotel, I decided to take a look at it on the Charles Booth Online Archive. 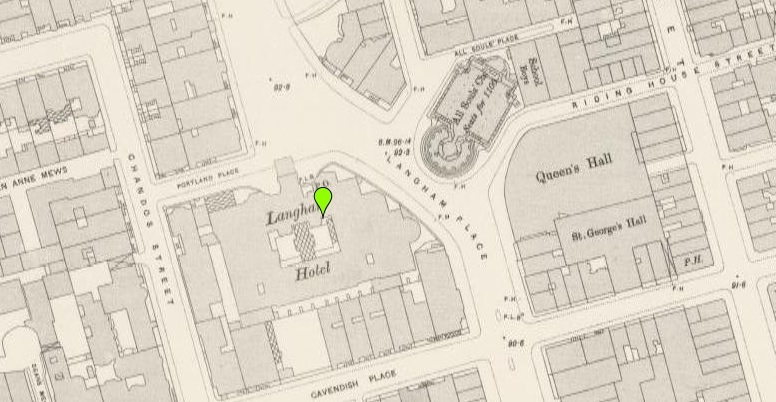 As shown on the map above, Booth classified the area surrounding the hotel as generally ranging from middle-class to wealthy–this was certainly no slum, to say the least. Bearing this in mind, it comes as no surprise that Doyle chose this as the hotel the King would be staying in, as the demographics of the surrounding area seem particularly fitting to the archetype. A search through British History Online revealed that this ritzy hotel also has quite a ritzy history. Until around 1860, the Langham was preceded on its lot by Mansfield House, the mansion owned by the Earl of Mansfield. When the hotel was finally built in its place, it cost over £300,000, going on to become, and remain, one of the largest buildings in the city. It officially opened with a luncheon in 1965, which the Prince of Wales attended. Needless to say, even the history of this hotel is absolutely bathed in royalty and riches, thus making it the perfect choice for the King’s hotel in A Scandal in Bohemia. The ten topics I originally chose were crime, love, money, face words, “chillin’ like Sherlock” (my strangely-named topic for words like pipe, sat, fire, smoke, silence, and bachelor), male descriptive words, detective words, investigation, sailing, and death. The following graphs show how some of these topics relate and, in exceptional cases, reveal interesting correlations with historical events that took place at the time when the stories in which they appear were printed, which I found really intriguing to delve into and analyze. These topics seemed similar enough. Ironically, however, trends appeared somewhat sporadic throughout, though there was a strong correlation roughly from 1909 to late 1911, with a significant peak in early 1911. This correlates most strongly with the release of The Red Circle (http://sherlockian.net/), though I couldn’t find any historical relevance. These topics, clearly connected through the crime of murder, showed a close trend in March 1922, the time of release of Thor Bridge (http://www.sherlockian.net/). In this story, the crime is, of course, murder (http://en.wikipedia.org/wiki/The_Problem_of_Thor_Bridge#Plot_summary). No related historical events were found. Yet again, these topics seemed to make sense together, but trends were very sporadic. There was, however, a directly correlated peak in March 1923, the time of release for The Creeping Man (http://www.sherlockian.net/), which makes perfect sense for obvious reasons. No direct historical relation was found. Figuring sailing and money were both tied to trade, I decided to look for trends between these two topics. Interestingly enough, “sailing” peaked in March 1904, then dipped in April 1904, at which time “money” spiked. In April 1904, the Entente cordiale was signed (http://www.branchcollective.org/), which established peace between France and England, likely opening up trade between the two, which makes sense with the spike in money-related words. The cause of decline in sailing-related words at this time, however, still remains unclear (or possibly unrelated). Figuring these words might be related through the written portrayal of how people respond to the people they love (with regard to facial expressions, at least), I thought it might be worth comparing the trends between the two. Sure enough, they peaked together in March 1922 and January 1924. March 1922 was the time of release for Thor Bridge (http://sherlockian.net/), which seems to be sort of a fluke in terms of trying to explain the relation to the prominence of these topics. January 1924, however, was when The Sussex Vampire was released (http://sherlockian.net/). This story, featuring a child as the culprit (http://sherlockian.net/), in conjunction with the obvious implications in its name, seems to fit the bill for a story that would predictably feature frequent mention of the topics of love and things having to do with the face. I was not, however, able to find any direct historical relation to the prominence of either topic. 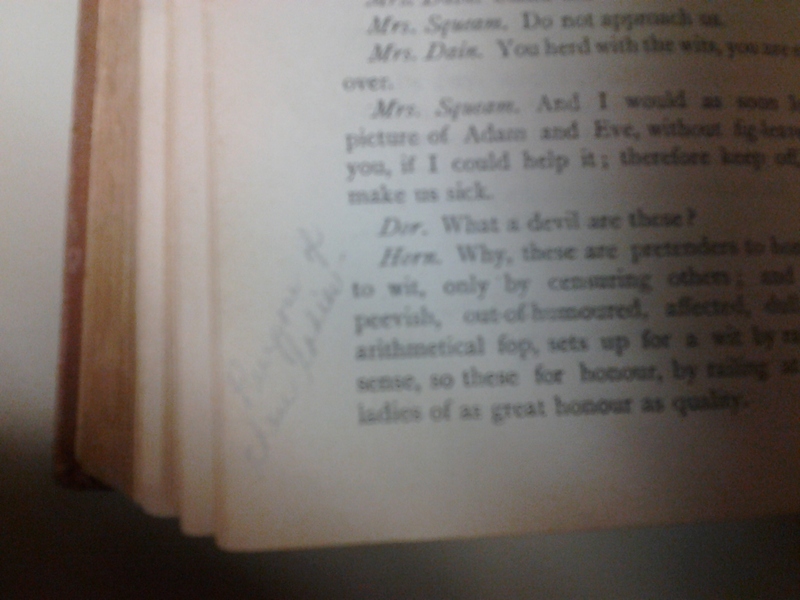 This, being the first time I’d ever attempted to search for marginalia, let alone marginalia from the Victorian era, proved to be a pretty difficult task. I must have looked through nearly twenty books before finally finding something noteworthy, and even still, I could barely read the handwriting. After searching through the stacks for what felt like hours, I finally stumbled upon a book titled Best Plays of the Old Dramatists: William Wycherley. A collection of William Wycherley’s plays, edited by W.C. Ward, this book was published in London in 1900 by T. Fisher Unwin. This particular copy’s call number is PR3772.W3. 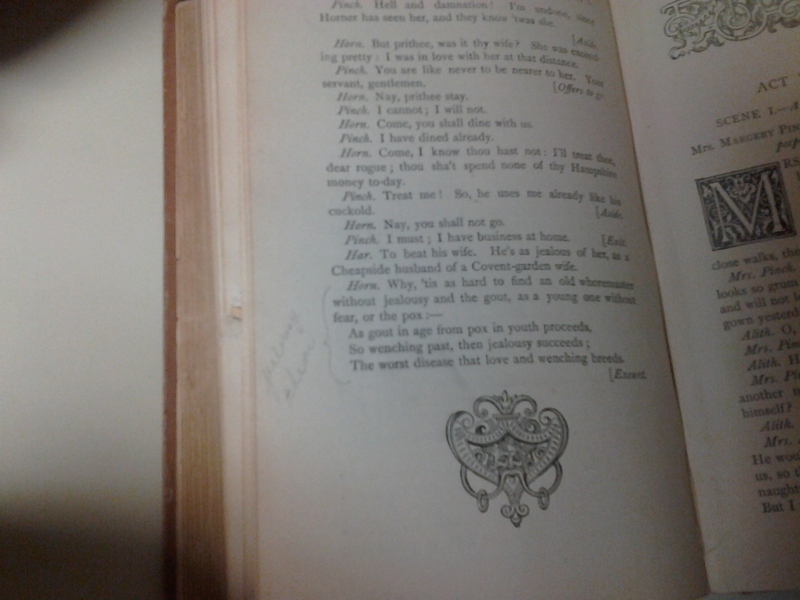 Given the nature of the book and what I was able to decipher of the scribblings in the margins, it seems like this book was most likely used for scholastic purposes, though it isn’t a definite. Notes have been made throughout the book regarding themes and overall interpretation, though the language used by the reader is somewhat colloquial in nature, which tells me that either a) they were really enjoying this book, b) they were so bored reading and studying they had to compensate by having a little fun writing their notes, or c) this wasn’t for a class at all and this person just really liked trying to interpret library books in the margins (this is, of course, a long shot, but hey, who am I to judge?). Also, I unfortunately had to rely on my shoddy flip phone camera, so the pics are a little fuzzy. Forgive me for that. It’s tough being stuck in the stone ages. 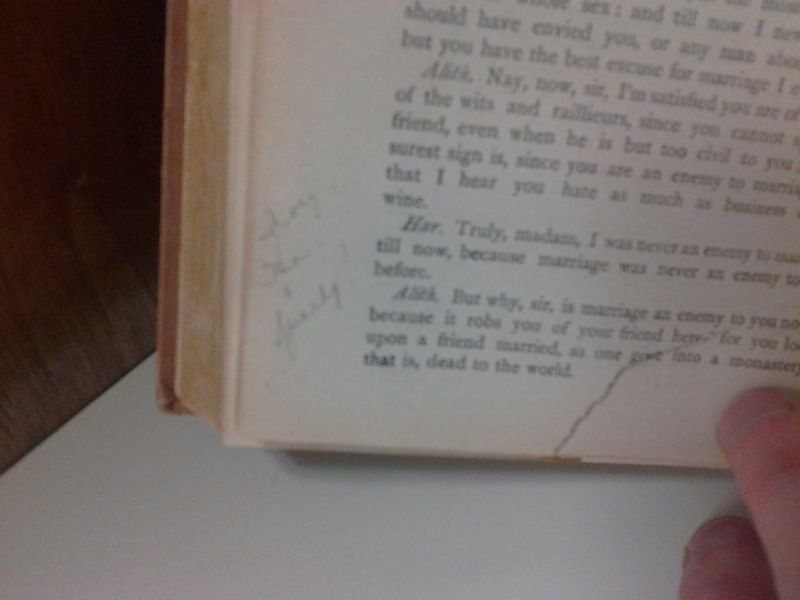 The first bit of marginalia I found, which made me initially think the reader was reading the book for a class, is a bracket encasing a set of lines, with a note beside it reading, “Jealousy theme.” As aforementioned, thematic sidenotes like this were made throughout the book, highlighting little interpretive bits and pieces of Wycherley’s writing. Another such note was made at another point in the book, this time noting, “Purpose of these ladies,” referring to some of the characters. Once again, this points to scholastic use by the reader, identifying another crucial piece of info, most likely so he or she could study it later on. Another note, this time of a more colloquial nature (as far as I could tell), seems to talk about the characters. Unfortunately, I couldn’t read most of it, but I noticed the reader created a bit of a sentimental/funny nickname for one of the characters in Wycherley’s The Country Wife, Sparkish, who the reader proudly dubbed “Sparky!” I wish I could’ve deciphered the rest of the handwriting, because I have no idea what the reader was even making a note of, but at least it showed their attitude toward the characters somewhat. Other colloquial/less formal notes were made throughout the book as well. My name’s Owen Whitley, I’m a senior, and my major is Industrial/Organizational Psychology. I spend arguably way too much of my free time playing guitar and writing songs. 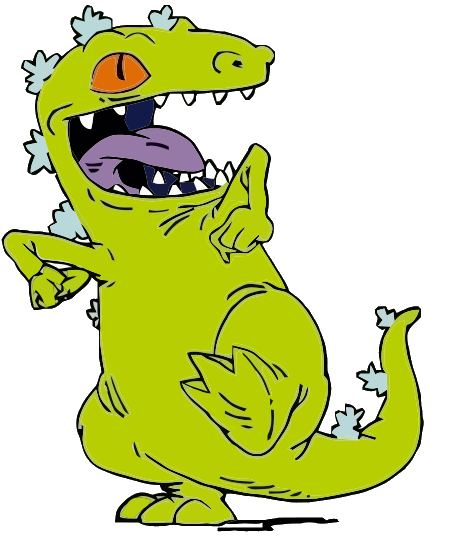 Here’s a picture of Reptar…because of reasons.